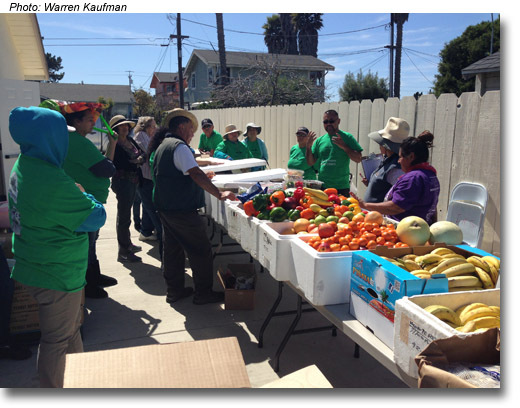 Beginning in May, 2013, nearly 70 volunteers began picking up groceries, collecting and sorting household items and clothing, boxing clothing for the worker camps and distributing food and clothing six days a week in five different locations in the Salinas Valley. Every day a volunteer picks up the Nancy's Project van at its storage facility and takes it to Safeway and Trader Joe's (who generously donate boxes of good food which would otherwise be discarded). More volunteers load the van to the roof with containers of food and flowers and return it to storage. In the afternoon, six days a week, another volunteer picks up the loaded truck and takes it to one of the five weekly distribution points where people are lined up waiting for the food distribution. The Nancy's Project volunteers are ably assisted by volunteers at four churches and one Greenfield home by local people who help assure that the distribution is efficient and fair. Many thanks to the clergy and staffs of: Christ the Rock Apostolic church, Salinas; the Vineyard Christian Fellowship Church, Salinas; Holy Trinity Catholic Church, Greenfield; and the Hispanic Seventh Day Adventist Church, Salinas. Special thanks to Salvador and Leonor Chavez and their family in Greenfield. These competent and caring people are wonderful partners. In 2018 Nancy’s Project celebrated five years of pickup and delivery for Nancy’s Project as a volunteer organization. It takes many people to perform the tasks Nancy Costello performed all those years. By the fifth anniversary date, our 50-plus volunteers had fed about 2,000 people per week for 250 weeks. That means people went home with sacks of groceries 500,000 times!